We had another fine TONKAWA turnout! Jane Dumas, TONKAWA Vice-President chaired the meeting. She opened the meeting at 12:30 with a prayer in Tipai. This warm, breezy day is beautiful. Good fellowship is all around us as the members greet and form into conversation groups. Jane Dumas had some issues and concerns to share with the group: Firstly, next meeting, September 19, 2004; Lena Mayer, past TONKAWA secretary sends her regards; a lifetime membership for Ruby Teton; the insensitivity of the Cabrillo Festival and her desire to see some recognition of local Tipai culture at these events. El Bisera reported on the HIV Aids services changes still ongoing. Rose Davis had the newest copy of Indian Voices and felt that the time is right for Voter awareness and participation in the democratic process. There were many voices sharing their experiences and knowledge over Cancer and how it affects families. Jane said she would ask Chris Gibson to be a speaker at our next meeting, September 19, 2004. Paul Razo Sr. appreciated all who attended his family gathering at Santee Lakes. Ben Nance came in and took all these pictures. Excellent healthy food brings smiles to the TONKAWA membership. Meat loaf with Au grautin potatoes, yellow squash soup, a wide variety of salads and spicy dressing. Loads of fresh fruit for summer diets. Once again Jane Dumas brought some beautiful plants for all to admire and someone to take home. Our lucky TONKAWA treasurer, Vicky Gambala, was in attendance and owner of that gorgeous plant. 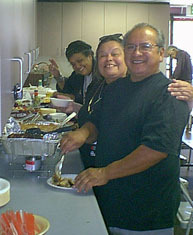 Don Vingeualt, Santa Ysabel Ipai, and his wife Jean were both back from recent surgery and treatment. They have a special diet but were warmly received and participated in discussions and the congeniality of the afternoon. Announcements of upcoming events were brought to the members attention: Orange County 8/27-29/04, Barona 9/3-5/04 & Sycuan 9/10-12/04 pow wows and sadly CA Culture Days in Balboa Park is cancelled for this year. 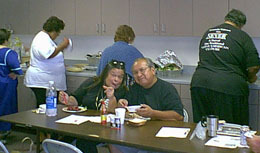 Maybe we will see you and a friend at the next meeting of the TONKAWA Elders: September 19, 2004. Our meetings are in the Many Nations: Chet Hunt Community room, 3928 Illinois St. San Diego, California.